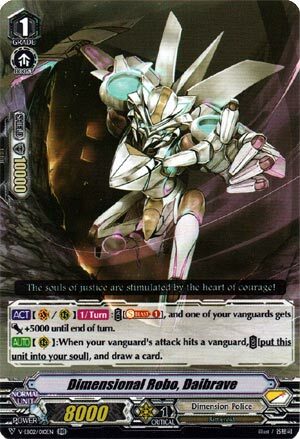 [ACT](VC/RC)[1/Turn]:COST [Soul Blast (1)], and one of your vanguards gets [Power]+5000 until end of turn. [AUTO](RC):When your vanguard’s attack hits a vanguard, COST [put this unit into your soul], and draw a card. Ratings are based on a 1 to 5 scale – 1 is bad. 3 is average. 5 is great. In case you’re ever worried you’ll run out of soul to proc those Daimariners and Daidragons and…well, this really, you have this card giving you a +0 wash. If not he can just sit comfortably on RG circle and continue to give you the numbers needed to proc Daiyusha, or at least threaten the skill if you can get him to just 28k with this and a Force Gift. 4-of staple. He does everything you want him to do.